To find where you can spend your trade dollars, please visit search.bartercard.co.nz and login with the last 8 digits on your card, and your personal name on the card. If you are using a Gift Card, enter your name as GIFT CARD. Bartercard Search is like Google Maps – you can navigate to Bartercard members which are near you. If you're using your Bartercard with an EFTPOS machine, you need to swipe the card, choose 'credit' and press enter. You will then be asked to sign the receipt. The Blackcard is our top tier card presented to Bartercard members which rewards top level trading, loyalty and promotion of the Bartercard exchange. The Bartercard Blackcard can be rewarded either for the level of lifetime trading or for the level of spend in the previous financial year. The Platinum card is presented to members who have traded a minimum of T$300K or more than 1500 transactions in the previous calendar year. No unresolved conduct related fair trading complaints. Qualifying criteria is reviewed yearly by Bartercard New Zealand, and the card status assessed and adjusted accordingly. The Gold card membership is available for those members who have traded more than T$50K per year. Fee payments for all Bartercard accounts must be paid on time. The Green card is given to all new Bartercard members. Ideal for one off staff incentives, prizes, gifts or bonuses for non Bartercard members. Gift Cards can be purchased for amounts between T$100 & T$500 and are valid for 12 months and can be spent the same way as any Bartercard card. The process of obtaining a Gift Card is quick and easy to do, simply download the Gift Card form here and submit to your Trade Broker. 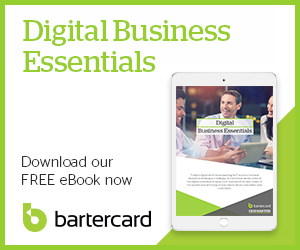 Gift Cards can be used within 24 hours of submitting the order to Bartercard. To find where you can spend your trade dollars, please visit search.bartercard.co.nz and login with the last 8 numbers on your card, with your name on card being GIFT CARD. Bartercard Search is like Google Maps – you can navigate to Bartercard members which are near you. If you're using your Gift Card with an EFTPOS machine, you need to swipe the card, choose 'credit' and press enter. You will then be asked to sign the receipt. Gift Cards can only receive funds once. If you are looking to make regular payments please ask your Trade Broker about a staff card or expense card.